Along Upper Serangoon Road, beside Punggol Nasi Lemak, Ding Tele 鼎特乐 is a new Shanghaiese restaurant that serves good sheng jian bao 生煎包 and other fantastic food. When we were there on Sunday afternoon, there was a queue and we waited for 15 minutes. During that 15 minutes, we had a chance to peruse the messy menu. 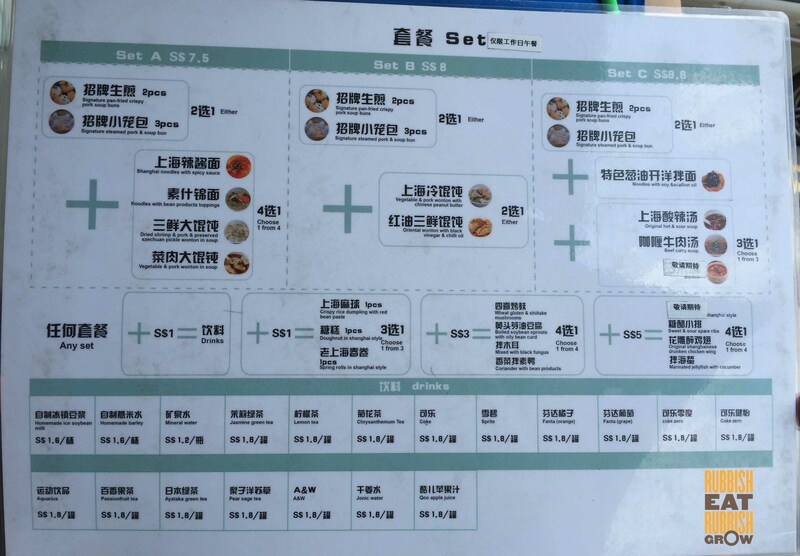 They have inexpensive weekday set lunch menus starting from $7.50, very good value. The food comes in small portions, so each person may have to order 2-3 plates. 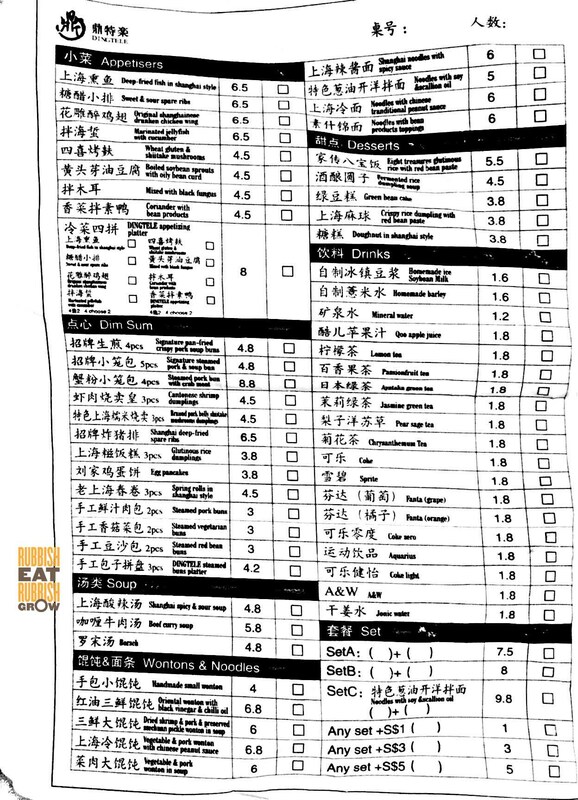 I don’t understand why they pluralize the word “mushroom” in the wheat gluten and shiitake mushrooms 四喜烤麦 ($4.50) when there is only 1/4 shiitake mushroom. But this cold dish is amazing. It must be one of the best thought-out dishes in the history of dishes. The beauty is in the simplicity: black fungus, shredded bamboo shoots, 1/4 shiitake mushroom, hard (not stewed) peanut, and wheat gluten (also known as seitan). There is hardness, softness, and gelatinousness; it is first mildly sweet, then musky and savory. Simple ingredients, but such complexity. Another signature of the shop, also a cold dish, is named sweet & sour spare ribs 糖醋小排 ($6.50), but should be more accurately named “sweet & vinegar.” Although it is too tough (Mr Fitness said, “You eat the last piece, do some exercise on your jaws”), the taste is spot-on. Some 糖醋小排 are too sharp, but here, it starts off mildly sweet before mellowing into a soft sourness. There is delicateness in what is usually a brash dish. It is very good. Skin is thin and very crispy, and so much soup inside. We see Chinese Nationals ordering just a big plate of this, and nothing else. 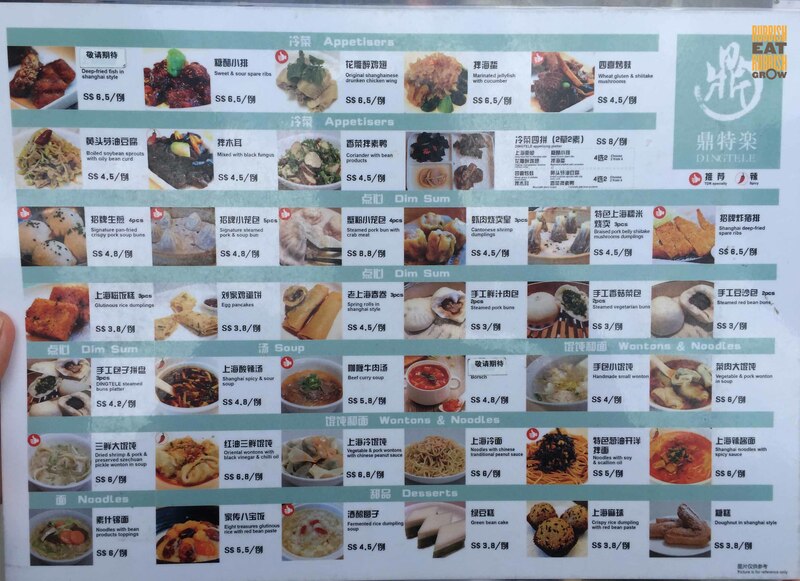 By the way, they hand-make their buns, so it may be worth trying other buns like steamed pork bun ($3), steamed vegetarian bun ($3), and steamed red bean bun ($3). Their steamed pork soup bun 小笼包 (5 pc, $4.80) is different from Din Tai Feng’s. DTF’s version is sweet, but Ding Tele’s is savory; both renditions are good, and this will boil down to personal preferences. However, not everything is delicious; some dishes are so salty I thought I was drinking sea water. The Shanghaiese drunken chicken wing 花雕醉鸡翅 ($6.50), another recommended cold dish—Shanghaiese really like cold food–is way, way, way, way too salty although after the salt, there is a mild taste of hua diao wine, too mild we think. The other overly salty kidney-failure dish, noodles with scallion oil 葱油开洋拌面 ($5) is saved by the excellent chilli. The chilli has no salt, no condiments, just chilli flakes and oil, and as a result, the chilli neutralizes the saltiness of the noodles, ending with a pleasing, addictive savoriness. Mr Fitness loves this dish. Besides the saltiness, one area that could be improved is the temperature of the dishes. We ordered 3 cold dishes and 3 hot dishes, but the hot dishes came lukewarm. Chinese food needs to be scalding hot when they come on the table. Go hot or go home. But on the whole, the food hits the spot and is better than most casual restaurants. We don’t usually return to restaurants but we will return to Ding Tele to try other items; we like the Shanghaiese restaurant quite a bit. Including two glasses of homemade soya milk ($1.60 each), we paid $35 for two persons, no gst, no service charge. Good value. 😍 shengjianbao! Thanks for this! Yum! Can’t wait to try this !